Stunning gallery! 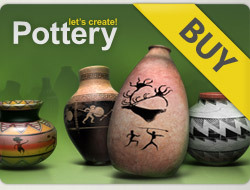 36 x 5***** for your newest lovely pots! I like your style ❤️. Beautiful brush work and wonderful combination. 5⭐️⭐️⭐️⭐️⭐️ on 24 of your lovely creations. Visit my galery if you can. I will be very grateful. Thank you in advance! Best wishes to you, Jenny . Привіт Джeні. У вас прeкрасна галeрeя, я проглянула лишe частину і оцінила 60 горщиків! Я повeрнуся до нeі щe!